Court warns action but Convention says 24 children will take part in temple ritual. Children at the centre were made to perform Chooral Muriyal in March last as part of Kuttiyottam ritual offered by Rajya Sabha MP Suresh Gopi. ALAPPUZHA: The Kerala High Court on Monday again refused to review the ban on Chooral Muriyal by Kerala State Commission for Protection of Child Rights (KeSCPCR). The petitioner, the RSS-backed Sreedevi Vilasam Hindumatha Convention at Chettikulangara temple, withdrew it after a division bench observed that the case had no locus standi since the same court had upheld the ban on March 7. The court ordered the district administration and district police chief to take penal action against the temple authorities if they went against it. Meanwhile, the Convention is all set to defy the order. It's president M.K. Rajiv said 24 children were taking part in the ritual. "There were 13 Kuthiyottam this year, and only three were in and around of Chettikulangara and the rest out of the district," he told a press conference, feigning ignorance about the court order. "If there is such an order, the police would already have taken action against us." The KeSCPCR issued the order banning the 250-year-old ritual on November 1, 2016, on human rights lawyer A. K. Rajasree's petition, citing the violation of child rights. But the temple went ahead went ahead with the ritual last year with 28 minors. 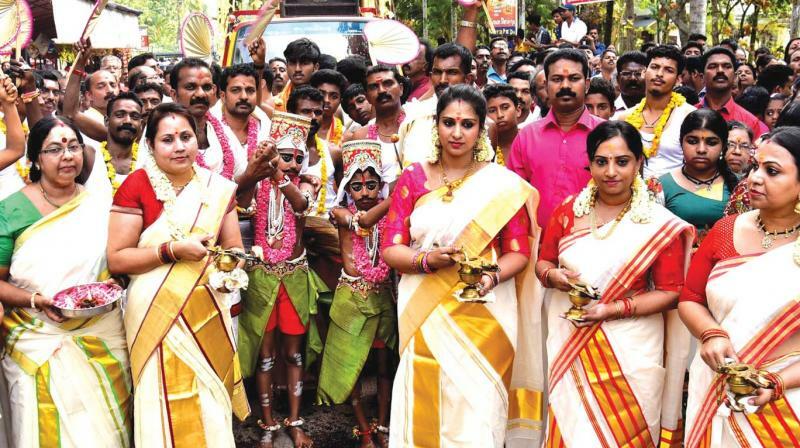 Rajya Sabha member Suresh Gopi was one of 14 devotees who offered a Kuthiyottam where two kids get subjected to Chooral Muriyal with pierced midrib and paraded with religious fervour. The boys aged between 8 and 14 years get training from Kuthiyotta Kalaris’ run by Kuthiyotta ashans (teachers). They dance and sing.